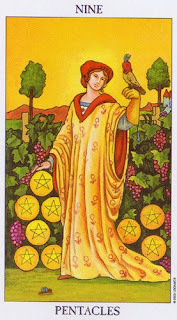 This is a beautiful card depicting a woman standing in what looks like a garden of contentment. Abundance radiates from every aspect of the imagery. She is wearing rich robes, and a falcon is perched on her hand. The vineyards are bearing an abundance of ripe grapes. In the distance is her castle flanked by lush gardens. In the foreground a snail slowly makes his way across the card. It was the nobility who indulged in falconry. To train a falcon took plenty of time, money and space. They were not in “survivor” mode like the working class, and had the means to dedicate themselves to the finer things in life. Things like wine-making and falconry. As the image in the card depicts, the nobility had the luxury of leisurely pleasures that such activities would bring them. With a slower paced life they could enjoy the fruits of their labour. However, the snail in the card also reminds us that this did not manifest overnight. It took great planning, patience and dedication to plant and nurture the vineyards to the point where they were heavy with ripe grapes, ready to be barrelled in preparation of a good wine harvest. It takes approximately 5 years from planting to nurture a vineyard to this point, and another 3-4 years in the barrel where the grapes ferment and slowly become a really good wine to enjoy later on. About 9 years in total before that first glass of delicious wine can be enjoyed. The number 9 on the card implies that the manifestation is almost complete, that this which has been worked for has almost reached the point of manifestation. However, there is still a bit to be done before the lady in the garden can enjoy the first wines from her vineyards. Herein lies today’s lesson. In order to reap the rewards of our efforts to manifest what we work for, we need to put a great deal of planning, time and dedication into it. Space to grow, just as the grapes on these vineyards grow. Patience that time alone teaches us, planning so that we can visualize the desired outcome long before it manifests, and dedication towards working at what we desire to manifest. Contentment too comes slowly, often when we have slowed the pace down enough to see opportunities and to appreciate the blessings that we have in our lives. It takes appreciation for what we have and who we are before we can taste the good wine of contentment. Nature is abundant to the point of waste, but unless we are able to slow down for long enough to appreciate and notice the abundance already present in our lives much of it goes by wasted and unnoticed. So, we need to take the time to appreciate our abundance and good fortune in life, we need to slow down as the snail does to see these, but to get there requires good planning, discipline and patience so that we too can all drink from the good life harvest.